Maximum flight altitude: Drones are not allowed to fly higher than 60 meters (200 feet) in Bangladesh. Maximum horizontal distance and FPV: Drones can only be operated in sight in Bangladesh. The use of FPV systems must be allowed separately. Compulsory insurance: In Bangladesh, there is compulsory insurance for drones. Maximum take-off weight (MTOW): No information found. Distance to airports: You have to keep a distance of 18.5 kilometers (10 miles) to airports, or you must obtain an authorization from the air traffic control authorities. Other safe distances: 9 km (5 miles) of distance must be maintained to a built-up area. You have to keep 300 meters (1000 feet) away from buildings, vehicles, people, animals, and ships as long as they are not directly involved in the flight maneuver. 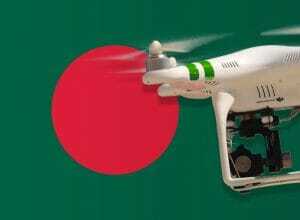 Flight bans: You are not allowed to fly with a drone over gatherings of people in Bangladesh. Time of operations: No restrictions found about the operating time. Specific regulations: In Bangladesh, a minimum age of 18 is required for the control of unmanned flight systems. Do not drink alcohol for at least 8 hours before flying. During your flights, you must have a fire extinguisher which can be used to put out a spontaneously occurring fire. Regulations for commercial pilots: Commercial flight maneuvers must be approved as well as private flights. Good to know: During a flight, you have to carry the following documents with you: approval of the CAAB, insurance document, a document with personal data of the pilot (name, address and telephone number), flight restrictions of the drone according to the manufacturer. Autonomous operations are only permitted if you can affect the trajectory at any time. We have researched the listed drone regulations for Bangladesh to the best of our knowledge. We can not guarantee the correctness of the information. If you want to be on the safe side, please contact the competent aviation authority. Alternatively, you can also ask the embassy in your country for further information about the regulations. Please leave us a comment when you receive news and/or gain experience with your copter in Bangladesh! Can I buy a DJI mavic pro drone from canada only for photography purpose will .there be any restriction. Am I allowed to take a drone with me to Bangladesh when I visit there? If so, what is the procedure? Thanks! you can.. somehow if you can enter Bangladesh with your drone.. then you can fly here with no problem..
Hello!Can I Allowed to take drone in Bangladesh for brother? Thank you, Francis for very well written post. Your post helped me a lot. I’ve been thinking about importing a MI Drone from China for so long. But because of the regulation I’ve stopped thinking about that. I know there is some regulations on flying drone in our country but some of my friends told me that there is also restriction on importing drone from abroad in Bangladesh. But your article maybe giving me a hope again to import drone. Can you please share your experience on Bringing drone here in Bangladesh. I mean did you face any kind off issues at custom for carrying drone with you? Thank you. Glad to hear! I haven’t been to Bangladesh so far. Well written, I use a long range drone in Bangladesh, have registered my drone with government rule here. So, before buy any high range drone, you must register your drone by government. Thanks for the great informative article. do i have to take permission before buying? and can i take the drone to bangladesh while the permission been processing through airport customs? I would like to use a ground facing camera drone, short range, for construction survey purpose. Can you please suggest way to get permission and cost for such permission. Any contact who can help to get that? Could you share some insights with us how to register a drone in Bangladesh? Thank you in advance! hello brother.I live in Bangladesh.How can I take permission to fly drone here in Bangladesh? Thank you very much for the information. But i need specific details. Can i have your email address so that i can share you my queries? Please ask your questions here in the comments. I cannot reply to all messages. Therefore it is better to communicate here. Other travelers can help you, and the answers are available for everyone. Thank you for your understanding. I‘m in Bangladesh at the moment. There is no control of foreigners at the airport. So no problem zo take with you. They check only locals. For most travelers, that are good news. But I don’t like people being treated differently. I want to go to Bangladesh on this 14th June with my Dji Spark. I want to know do the airport custom allow me to pass with it??? I have the same question. Please someone help me as well. Did you take your drone to Bangladesh? And did they stop and check your drone? Do costoms polices seize all drones? Is there any size, weight limits? It should not be a problem for you to bring your drone to Bangladesh. I have a question I have the dji Mavic Pro 2 I was bron and rise in Bangladesh but now I’m a America passport holder can I take my drone with me?? Or the custom will take it?? My nephew brought a dji tello from usa..
Dji tello is a mini camera drone..like a toy drone..Will there any problem while bringing it to Bangladesh? I am Bangladeshi, live in Dhaka .10th july I will visit the Thailand. If i bought drone from Thailad , will there is any problem.If there is problem what is legal procedure to brought it?????????? ?